You can pack Banana Paratha for tiffins for the young ones at home. They are surely going to ask you to pack it for lunch again! 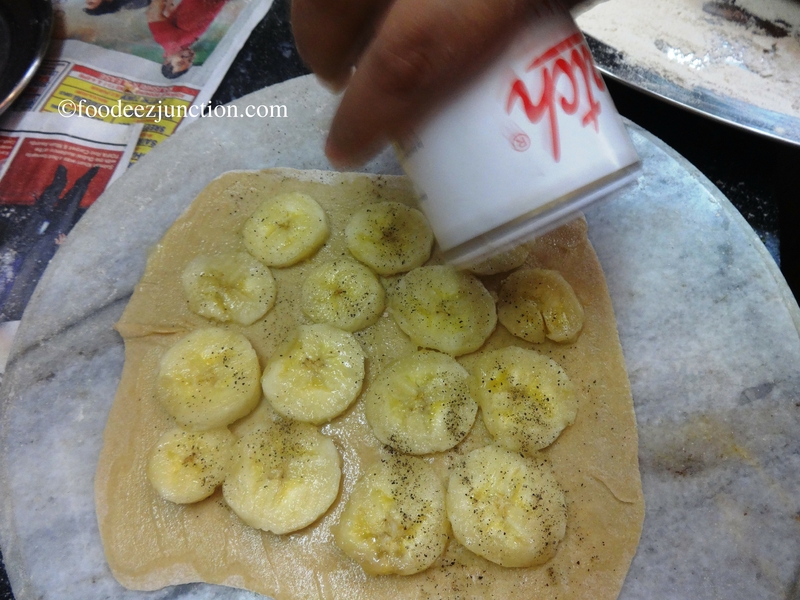 This Banana Stuffed Paratha Recipe is very easy and simple to make. All you need to make this Paratha or if you want to have more, parathas, are – ripe bananas, pure ghee or butter, black salt and black pepper powder and oh! the dough! Time Taken 10-15 minutes, if you have the kneaded dough already. Make 4 parathas with the following ingredients. Take the ripe bananas and peel them. Now cut thin slices of these bananas and keep it aside. Take the dough. If you don’t have the kneaded dough already, knead it as you do for Roti or Chapati for at least 4 people. The dough shouldn’t be too soft. Make eight equal balls from the atta dough. Take one atta ball at a time and roll it in to a small roti. Fold the four sides of the roti, overlapping each other and roll with a rolling pin in a square-shaped paratha. Repeat the process for all the atta balls. Now, keep the tawa or girdle on high flame. By the time the tawa gets heated, let’s do the stuffing in the parathas. Take one raw paratha, apply pure ghee evenly on it. Now, one by one, place the banana slices in rows and columns, leaving somewhat space on the sides. Place the banana slices one by one only, do not overcrowd. Sprinkle 3-4 pinches of black salt and 1/3 tsp black pepper powder (kali mirch). Place the other paratha over it and seal the sides with light hand. You can roll over rolling pin on the sides but with a light hand. Do Not over do it, else the paratha will stick on the surface. The tawa (girdle) is heated by now. Apply desi ghee or butter on tawa and put your banana stuffed paratha on it. Flip after 40-50 seconds and let it cook for a minute. Repeat the process for other three parathas. 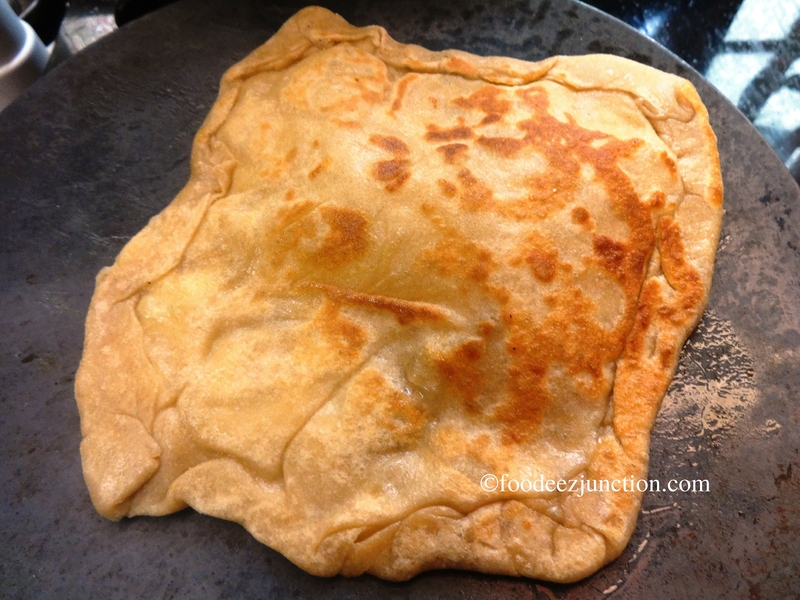 The Banana Stuffed Paratha with the given Recipe is ready to eat! Have it hot. I’m sure your kids will love these parathas. Reminds me of delhi’s paranthe wali gali… Had banana stuffed parantha there that was a beautiful sweet treat… Yours look great too!! Likewise!’ Looking forward to see more interesting recipes!